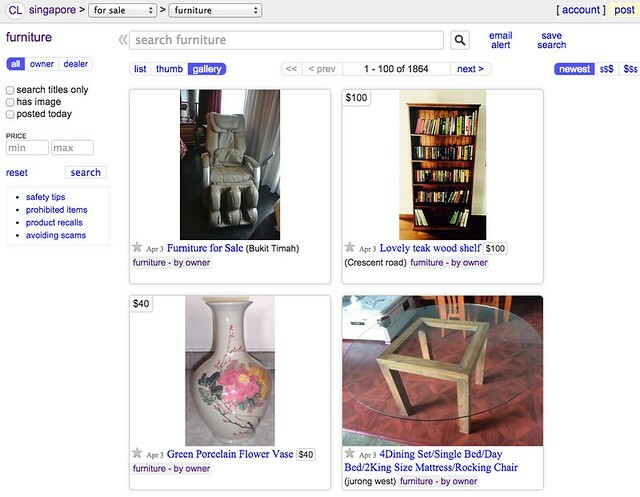 Craigslist is a free online classifieds where you can put up ads to sell, or request for goods and services; you’ll also be able to sell your second-hand furniture on their “Furniture For Sale” section. Craigslist is totally free of third party text advertisements, there’s also no paid listing options that stick ad posts on the top of the page. If you’re looking to sell your items with free ads, Craigslist is a good place to do so. The listing pages on Craigslist is very simple, your ads are listed with a thumbnail photo, along with a title. This format allows the site to list many items on a page, while also allowing users to quickly browse through all the items. Posting up an ad on Craigslist is a straightforward process, split up into multiple steps. You choose a relevant category for your ad, edit the text for it, and upload your photos. Your ad will stay active for 45 days. For users who are concern about sharing their contact emails or phone numbers, they can use a temporary Craigslist email that masks your real contact information. Another good feature on Craigslist “Furniture For Sale”, is that its listings can be filtered to show ad posts by owners and/or dealers. This means that users can easily sift out spammy duplicate posts that dealers usually post up. There’s also an effective search feature that allows users to quickly find the items they’re looking for. It’s simple to use, and it works. All these makes Craigslist a good platform to sell your items and pre-owned furniture on.